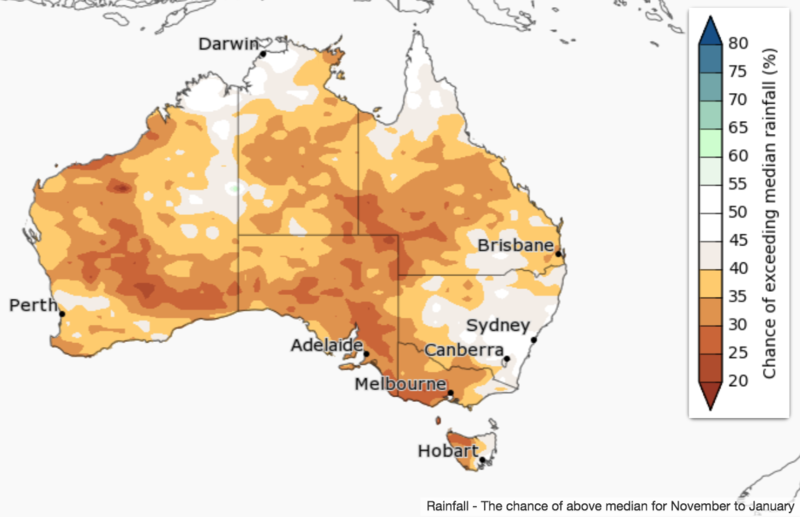 MANY properties remain in the grip of drought, where rain has fallen follow-up is still needed and the Bureau is forecasting below average rainfall for most of Australia over the next three months. 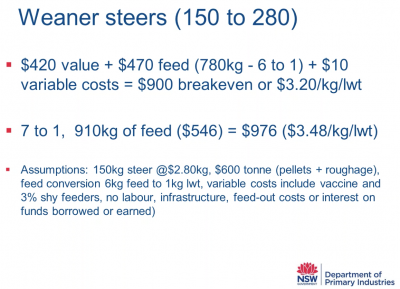 With hotter months returning it is now crunch time for many livestock producers, livestock officer Geoff Casburn told the recent NSW DPI Livestock Systems webinar, with decisions needed on whether to buy feed for the next six months or sell some or all livestock now. 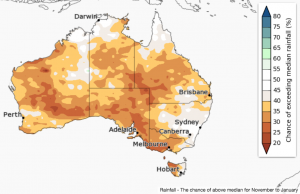 While predicting when the drought will break on your property is impossible, there are tools that can help to make informed decisions around whether to sell livestock now and buy back when the drought breaks, or whether to feed. One of the most important tool farming families have in making these assessments is their humble kitchen table. “The first tool we have is the kitchen table and I can’t stress this strongly enough,” Mr Casburn said. All members of farming families worried about drought, and openly discussing strategies played an important role in helping all members cope with the pressure. “A smart farmer once said to be a problem is only a problem when you’re not doing anything about it,” Mr Casburn said. “So it is really important everyone in the family and the business understand how the problem is being addressed. 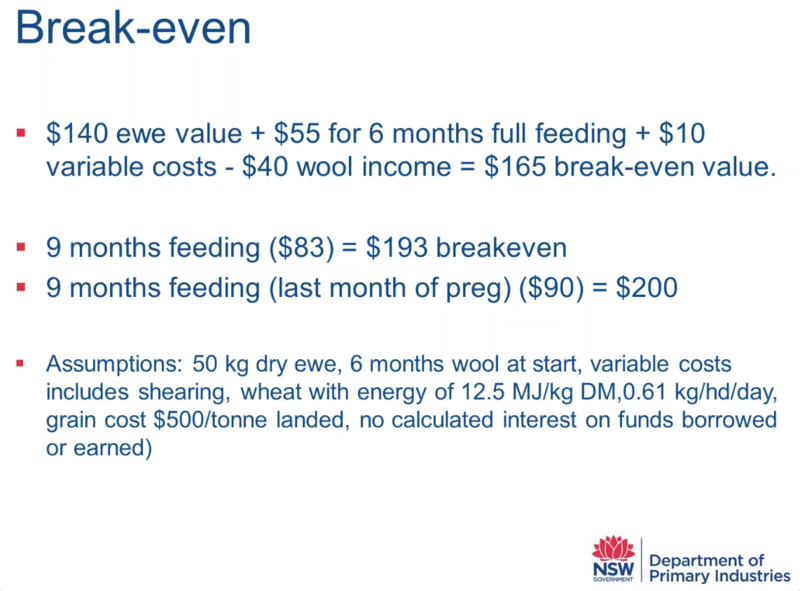 Here are some break-even calculation examples Mr Casburn offered to help cattle and sheep producers determine whether they would be better off selling some animals now and buying back when the drought breaks or whether it is better to spend money on buying in feed. Slide from Mr Casburn’s wbinar presentation. Click on image to enlarge. Should the drought continue for nine months instead of six, requiring feeding for that period, the cost of feed would increase to $83 per head, lifting the break even price in nine month’s time to $193 per head. 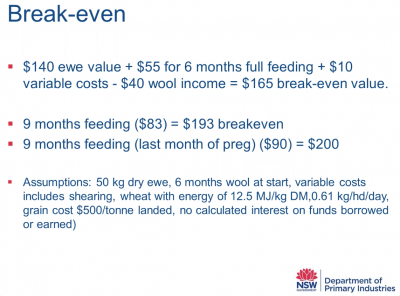 As ewes would be joined during that period an increased nutritional requirement for the last month of pregnancy needs to be factored in, lifting feed costs to $90/head, resulting in a break even price in nine months time of $200/head. Current value of 35kg lamb $120 per head. 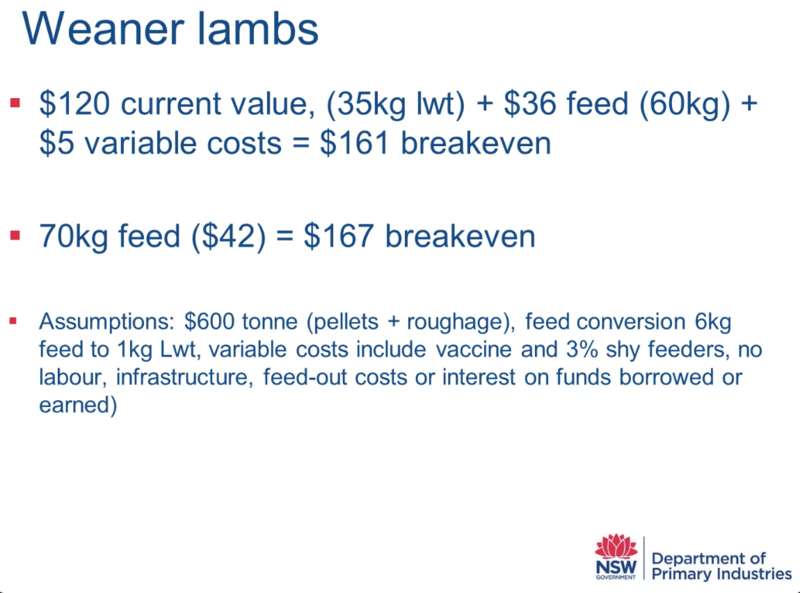 Calculation includes $5 worth of variable costs, including three percent of lambs being shy feeds. “So I can either sell them now for $120, or I can feed them with the hope I will get more than $161 at the end of that period,” Mr Casburn said. 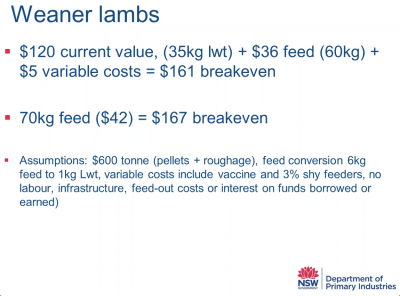 If the feed conversion ratio is not quite as good and 7kg of grain is needed to achieve every 1kg of liveweight, 70kg of feed would be required at a cost of $42, lifting the break even to $167 per head. The above calculations do not incorporate labour, infrastructure, feed out costs or interest on funds borrowed or earned. 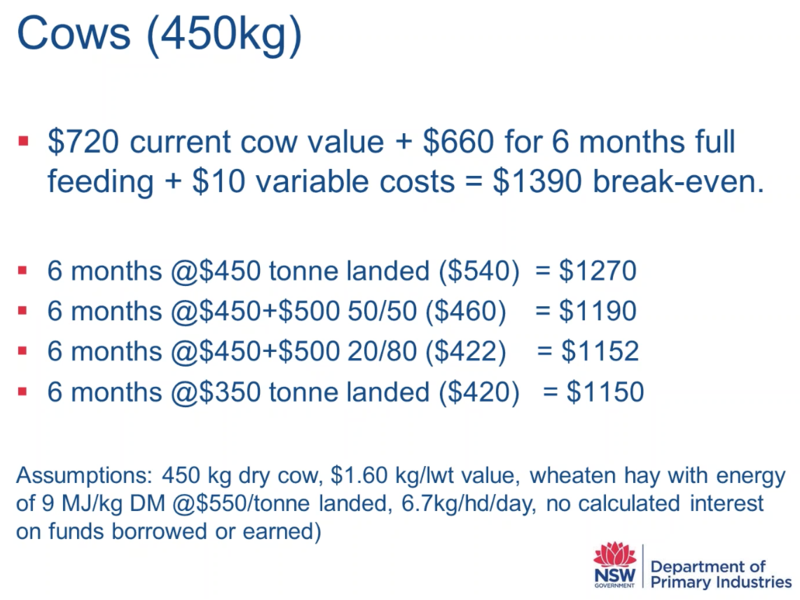 Current value of 450kg cow, D1 score (relatively light condition), is $720, based on 160c/kg liveweight. Buying wheaten hay at $450/t landed instead of $550/t landed would reduce the break even price to $1270. 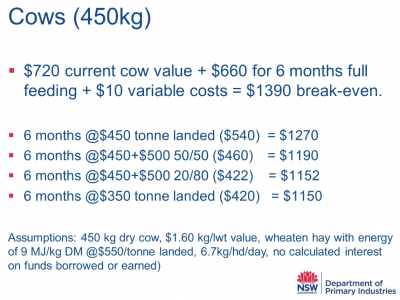 Feeding a ration of 50pc wheaten hay (at $450/t landed) and 50pc grain (at $500/t landed) further reduces the feed cost for the period to $460 per head and brings the break even price back to $1190. Feeding a ration of 20pc wheaten hay (at $450/t) and 80pc grain (at $500/t) brings the feed cost back to $420 and the break even down to $1150. The price paid for grain and the efficiency of the feeding system can have a dramatic effect on the break even calculations. The above calculations do not include wastage of grain being fed out on the ground or grain that passes through undigested, which can be in the 15 percent range, and nor does it include calculated interested on funds borrowed or earned. Variable costs included of $10. Break even price at end of period: $900. 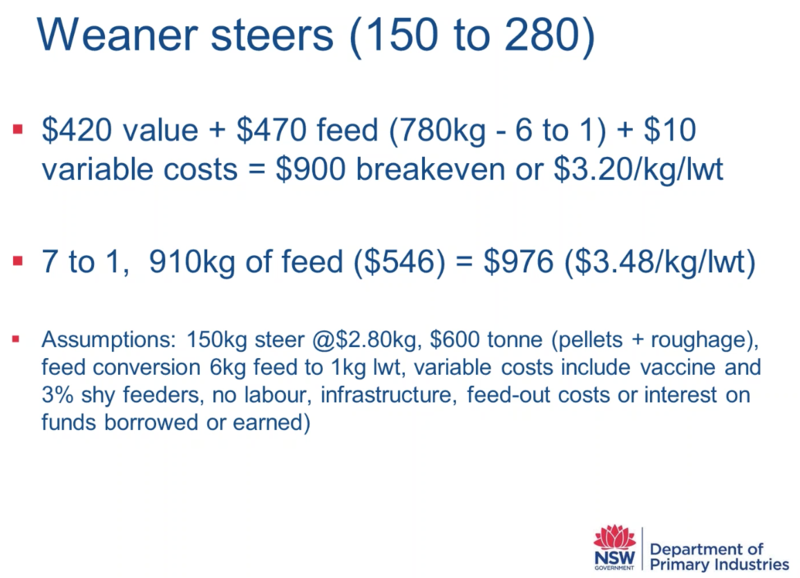 Less efficient feed conversion ratio of 7 to 1 would increase feed requirements to 910kg costing $546, for break even of $976.